Welcome to my first blog post! …hopefully the first of many to come, as I really immerse myself in this journey of mine, and hope to share it with you…. Lately I have become almost obsessed with using my ‘other hand’ or non-dominant hand to draw with (some of my facebook and instagram fans will attest to that!). I first “tried my other hand” … albeit reluctantly… in a class I took with Ivy Newport a few months ago. Since that time I have read several books and done my fair share of google research (yes I’m a google addict too) on using both hands, not only to draw with but also to write and journal. I’m so in love with it that I have now dedicated a whole journal to ‘other hand’ writing and doodling! …and wow it is incredibly liberating and freeing, and well, just plain fun!!! …it’s like being a kid again and being able to play, and that is something that has been missing from my life for a long time…too long. It’s also quite disturbing to me that I have forgotten how to play…well I am learning again! And I’m planning to put a swing in my garden, but that story is for another time. I have discovered many things, I won’t detail it all here, but suffice it to say there is no going back when your other hand starts to play in the creative realm! It really does draw on that other side of ourselves, the more often than not, hidden self, our higher self. I find myself writing words (in a very messy fashion and barely legible!) that I didn’t know I felt, or actually I probably did but they were somehow locked away in that other side of me. My other hand has access to all that “stuff”. Also I’ve had the sneaking suspicion that my right, and dominant hand, was taking note of my other hand, and learning from it, so today in my journal I did a little exercise. 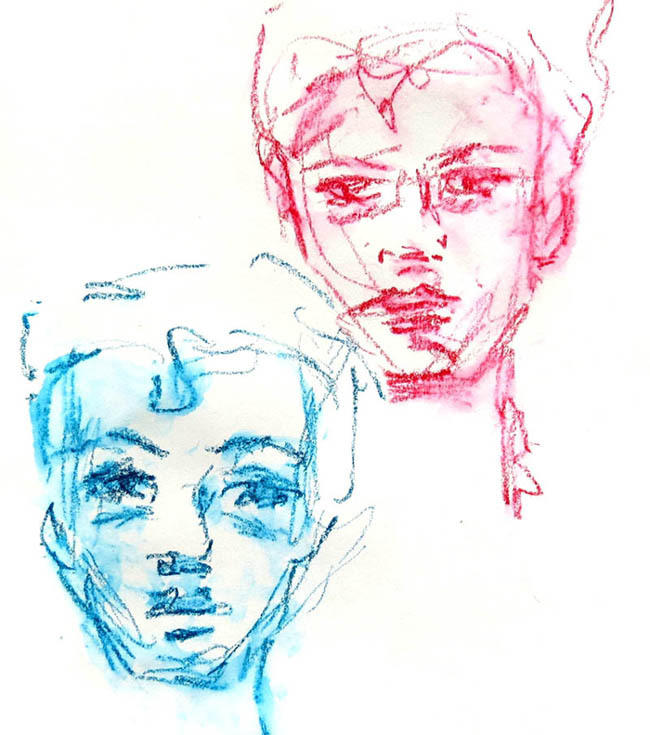 First I drew a face with my right hand, then with my left, the same face – actually from a photo of my father, who I lost at a young age, so it is a masculine face. For an unknown reason I chose the red crayon to draw with my right hand, and the teal crayon for the left non-dominant hand. These are about 90 second sketches. The main thing I notice is that although both are similar and very loose in nature, so yes the right hand is learning to be freer, the teal drawing looks more feminine and the red more masculine. This seems to be in alignment with what I am learning, that the non-dominant hand, which generally uses the right side of the brain, is the more feminine aspect of ourselves, our softer more (often) hidden self, our higher self, our soul self. So the experiment will continue, I am astonished and overjoyed with each discovery and revelation on this journey of the “other hand”, my artwork will never be the same, and neither will I! I loved drawing and painting as a teenager and a saw a post from a friend of mine about your classes. She sent me the link and I have watched some of the videos. I love your work. I would like to start trying to make my own creations based on your classes. I am really excited and look forward to perhaps starting after Easter. This is really interesting Toni. I must look into it and give it a try some time. I’m left handed for painting and writing, but use my right hand for things like sewing, ironing vacuuming etc. . Your post has certainly made me think about the way I paint. It is so interesting Robyn, and the more I work with it the more I love it! Very well done .i thought the information quite intriguing . I could have written these words myself. I’m finding my inner self with my non dominant hand too, a self that I thought was murdered at a young age. It’s such an amazing journey! I’m interested in what you’ve been reading, would you be willing to share? Yes Christy! It is so revealing to me. This is my current favourite book on the topic, I highly recommend it 🙂 The Power of Your Other Hand by Lucia Capacchione. Love this Toni…congrats on blog. I look forward to more. Wow excellent new blog post and interesting topic… keep us posted!